A versatile leaf cleaning tool for pool. Scoops out leaves,bugs & other kinds of debris from your swimming pool,pond, hot tub, fountain or large fish tank. Leave water sparking clean & inviting. Durable nylon micro-mesh net, can quickly capture all types of leaves or debris even the smallest insects before they land at the bottom off you pool. A high quality pool skimmer with thick and durable plastic frame-large,easy to use, and very durable. The leaf skimmer is compatible with most standard pole, quickly and easily clips onto any telescopic pole. Works with or without pole! You'll need a telescoping pool pole with 0.98" inner diameter. The leaf net is super lightweight, very easy to maneuver. The thick plastic flame with Curved Edges mean no sharp spots to damage pool sides. Wont scratch pool liner. POND LEAF & DEBRIS REMOVER : A versatile leaf cleaning tool for pool. Scoops out leaves,bugs & other kinds of debris from your swimming pool,pond, hot tub, fountain or large fish tank. Leave water sparking clean & inviting. LIGHTWEIGHT NET & CURVED EDGES : This nylon leaf net has heavy duty plastic frame,very durable and has long lasting. Durably strong fine mesh net effortlessly glides and scoops up leaves and debris. Angled stitching of the corners makes it easy to empty. Ideal for scoops out some leaves,debris or other small items of swimming pool. FITS MOST STANDARD POOL POLE : Compatible with most standard poles or use hand-held while swimming, can be cliped on any standard telescopic pool pole. POLE NOT INCLUDED! 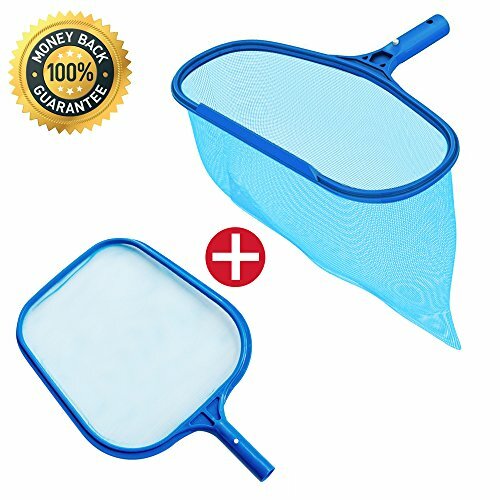 DEEP-BAG POOL SKIMMER : Wide deep net and skimmer pays for itself saving you cleaning time, less vacuuming and filtering. Efficiently picks up large leaves and off the bottom and skimming the lighter debris off the top. SHALLOW-BAG SPA LEAF NET : Heavy duty lightweight polypropylene frames easily maneuver above and the surface. Great for cleaning out large pools, kids pools, hot tubs and even water troughs. If you have any questions about this product by KATEVO, contact us by completing and submitting the form below. If you are looking for a specif part number, please include it with your message. Simpooltec Widemouth In Ground Pool Skimmer Plug - Fits Skimmer Openings 5 5/8" X 15 3/16"
Skimmer Plug SimPoolTech AGWM-SW2 Winterizing Above-Ground 11-3/8" x 4-7/8"